My wife took this photo today at The Drupal for Government Conference at NIH. The man in the photo was not only participating in the conference, but also taking notes on his Apple Macbook Air. It is incredible how technology is helping us do our jobs and be ever more productive. This is the vision of technology taking us beyond the natural limits we all have and face. I remember a few years ago when I was in the hospital for something and feeling bad about myself, and my wife brought me a laptop and said "Write!" --it was liberating and I believe helped me heal and recuperate. 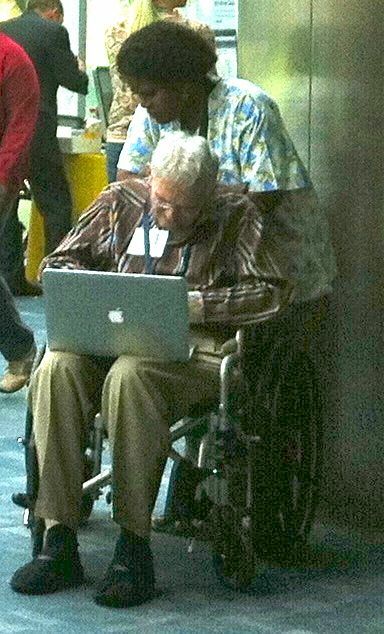 I wonder if hospitals in the future will regularly provide computers and access to patients to not only keep them connected with their loved ones, but also let them have more options for entertainment, creativity, and even productivity, to the extent they can, while getting well. Kudos to this gentleman--he is truly a role model and inspiration for us all. 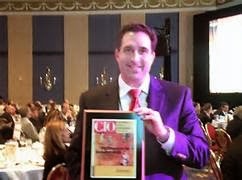 Really grateful to be honored this week by CIO Magazine with 2010 "Ones To Watch Award." Also, met some tremendously smart, talented, and nice people at the conference and award dinner. Among them--CIA, Special Forces, Fortune 500 CIOs, Social Networking Guru, Prior Professional Kite Flyer, and many others.